This particular pot is very useful and versatile due to it's straight sides. It is great stews and beans. As the rest of our clay products from Pereruela, Spain, they are produced by our artisans the same way it has been done for thousands of years. The Clay Pots of Pereruela are unique due to the composition of clays found in the area and made from two different types of clay. They are composed of a heavy, slow-drying red clay which gives the pieces its strength, and a white clay containing quartz, feldspar, and mica that can be seen with the naked eye and gives the pieces its refectory properties. Together they form a unique combination which actually hardens further each time it is used ensuring that you will enjoy your cazuelas for years to come. Since the heavy clay can only be molded by hand, they give the pieces a unique look which identifies them as uniquely from Pereruela. They are glazed on the inside but only part way on the outside, which together with its "sandy" texture, gives it a very rustic look indeed and its character. The Cazuelas from Pereruela can be used in the oven, microwave, stovetop, or open flame, and can go directly to the table for a sophisticated presentation. The pieces can be used directly on a gas or electric range, however, it is recommended to use a heat diffuser on electric ranges. The heat diffuser (which can be used with gas stove as well) has the added benefit of distributing the heat slowly to prevent foods from burning. A clay Cazuela should not be submitted to drastic changes in temperature. Let the Cazuela adjust slowly to heat, letting them slowly heat up until they are hot, either on the stove or in the oven. Likewise, you should also the Cazuela to adjust to room temperature before washing or storing them, and never sit a hot Cazuela on a cold surface such as granite or tile. To clean a Cazuela, simple washing with soapy water is usually all it takes to clean the Cazuelas. Normally, the clay glaze prevents things from sticking, but in can of a scorch, fill the Cazuela with warm soapy water and let it soak briefly, then lightly scrub it with a soft sponge or soft cloth after the scorching has softened. For particularly touch scorches, the Cazuela will benefit from boiling water in it to further soften the scorch. Do not use metal or abrasive pads as they may scratch the surface. Do not place the Cazuela in a dishwasher and avoid strongly scented soaps as they may flavor the clay. Always use wooden utensils with the Cazuelas as metal utensils can scratch and damage the inside. Over time, the Cazuela make develop a film or marks which can be removed by filling the Cazuela with a dilution of water and vinegar. As with most handmade products by artisans around the world, and due to the heavy clay and glazing process, the pieces may have slight imperfections in the form and finish of the materials. These imperfections do not compromise the aesthetics or functionality of the pieces and give the Cazuelas their unique character. 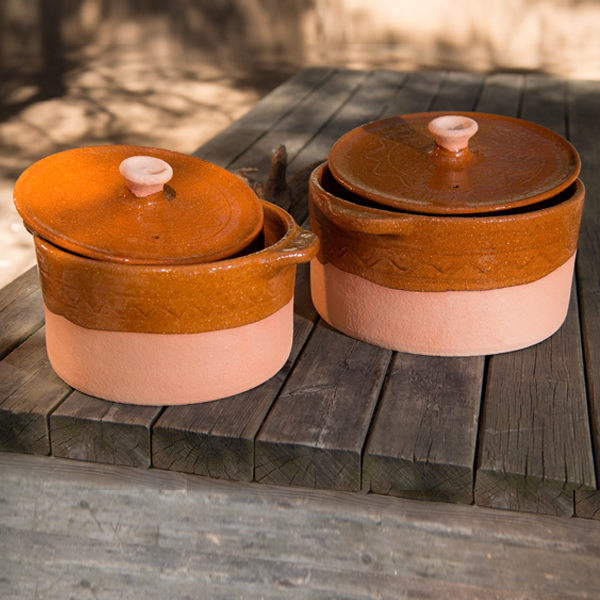 As with every Clay Cookware, the Cazuelas must be “cured” prior to its first use. The traditional method is to soak the Cazuela in water overnight for 24 hours. Due to the composition of the clay, this simple method ensures that pores are sealed and therefore will become watertight. Additionally after the initial soaking, a clove of garlic should be rubbed on the bottom of the exterior. This is especially more beneficial on the deeper Cazuelas used for soups and stews. After the initial soaking, very little maintenance is needed.